The image and reputation of countries can be a real deal maker – or breaker. How your country and nation is perceived by overseas audiences has implications for your success as destination, your economic development, public diplomacy and talent attraction. The Anholt-GfK Roper Nation Brands Index provides a useful (and among place branding professionals highly regarded) benchmarking opportunity for those in charge of country brands. The latest version of this annual place brand study was just released. We caught up with Vadim Volos, Global Director of the Anholt-GfK Nation and City Brands Research Program at GfK, to hear first hand about the winners, losers and tendencies in country brand performance. Vadim, which findings of the 2017 Nation Brand survey by GfK did you find the most intriguing? By far, the US’ drop to the sixth place in the ranking. The most intriguing question is whether the nation will bounce back in NBI ranks next year? We observed that most nations’ reputations do not undergo major changes from year to year, but the U.S. has demonstrated its ability to break with the trend in the past as well as its ability to ameliorate its image in a year’s time when it rose from 7th in 2008 to 1st in 2009. Japan and France. 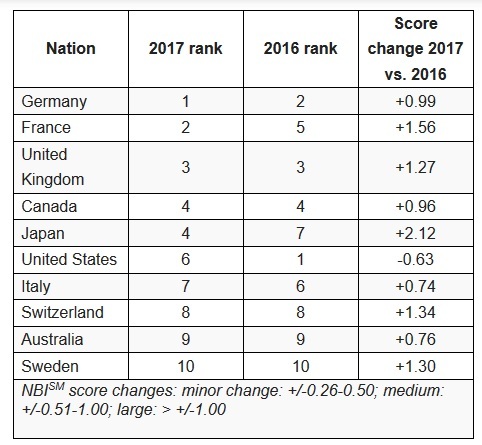 The global public lauds Japan and France after both suffered sharp decreases in score in 2016. However, Japan and France have not simply regained the confidence they lost in 2016, they emerge today stronger than in 2015. France’s greatest strengths remain its Culture (#1) and Tourism (#2), followed by its Exports (#5). The two indices where France’s improvement is noticeably greater than the average are Governance and Immigration and Investment. 2017 also marks a banner year for Japan, which earns the highest ranking since 2008. Japan’s signature strength is its Exports, for which it earns the top spot on the index. USA. Diminished confidence in the U.S.’s Governance fuels the U.S.’s decline (-3.81). Mexico rates the U.S.’s Governance a full 15 points lower than it did in 2016 (-15.02). The U.S.’s Governance falls from 19th in 2016 to 23rd now, behind Northern Ireland, Poland, and Singapore, barely registering within the top half of nations. No one or two countries caused the US score drops; the effect came from a variety of nations that marked the US down in key categories, while fewer nations marked the US up. The US has a polarizing image: the country experiences the largest declines in scores among the people of Mexico and Germany, while improving its image considerably in China and Egypt. Looking back over the last five years, which trends do you observe, with regard to nation brand performance across your criteria? I would like to highlight one welcoming trend: progress in world’s image of Latin American nations, a region that experienced decades of turmoil and now making strides towards progress and stability. In 2017, Mexico, Chile, and Peru all manage to outperform the score improvements of a nation near them on the rankings, which allows them all to move up one place. This is consistent with their overall progress in the past five years, across a variety of reputational categories. The global public sees unique, differentiated strengths in each, which facilitate their growth. In the past years, Mexico’s score improvements are most impressive on Culture. Chile receives large score gains overall, but most noticeably on Tourism. Peru gains most strongly on Governance. In all, 20,185 interviews have been conducted with at least 1,000 interviews per country. Adults age 18 or over who are online are interviewed in each country. Using the most up-to-date online population parameters, the achieved sample in each country has been weighted to reflect key demographic characteristics such as age, gender and education of the 2017 online population in that country. Additionally, in the U.S., the UK, South Africa, India, and Brazil, race/ethnicity has been used for sample balancing. 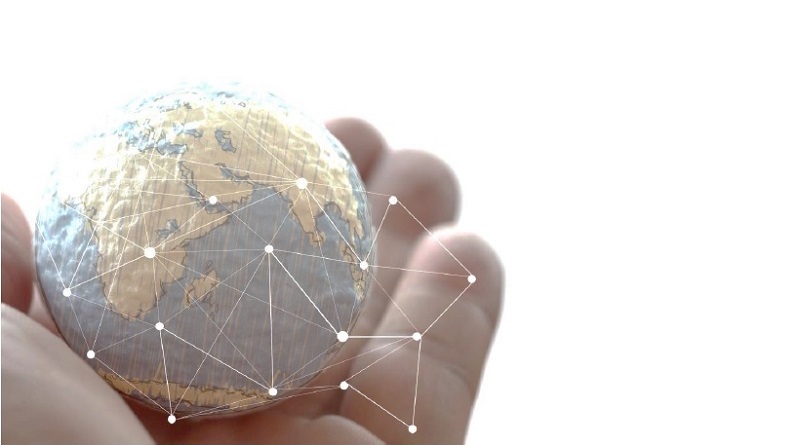 The report reflects the views and opinions of online populations in these 20 countries – citizens who are connected to the world. Fieldwork was conducted from July 7th to July 25th, 2017. NBISM measures the image of 50 nations. In each panel country the list of 50 nations is randomly assigned to respondents, each of whom (except Egypt) rates 25 nations, resulting in each nation getting approximately 500 ratings per panel country. In Egypt, where respondents are not as familiar and experienced with online surveys, survey length is reduced, resulting in each nation getting approximately 200 ratings. More about the 2017 Anholt-GfK Roper Nation Brands Index here.